Blogging about Prehistoric Life, the Universe and Everything. The ecological information which can be gleaned from the fossil record is controlled by the processes of accumulation involved, according to a paper by the University of Chicago, which is to be published in the May issue of The American Naturalist1. The fossil record is capable of capturing both the larger scale trends of evolution, and of the ecological responses to shorter-term or localised environmental changes. Despite this, the variability in successive fossil assemblages is often much less pronounced than that seen by ecologists over much smaller periods of time – giving out the impression that animal communities are more resistant to long term ecological changes. 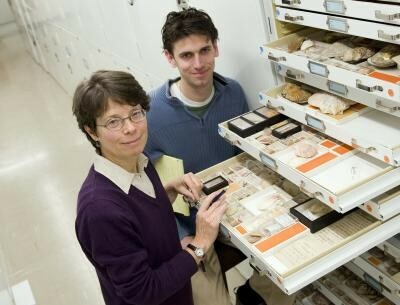 University of Chicago’s Susan Kidwell and Adam Tomašových examine collections of molluscs at the Smithsonian Institution. Photo credit - Bill Denison. Using studies of living and fossilized communities, Tomašových and his colleague Susan Kidwell have set about trying to assess where the low degree of variability found within palaeontological communities comes from. Two theories have been put forward – one that it comes from the natural “time averaging” of fossil remains that occurs during post-mortem accumulation – or secondly that the communities themselves are acting to maintain a set composition: for example, by adopting a preference for a specific ecological niche which enables them to survive extinction by maintaining high rates of growth with low population sizes. To understand this problem, the researchers simulated the effects of time-averaging on two living communities – one from within a lagoon in Texas, and the other from a lake in east Africa. It was noted that low variations in community composition across time can be produced by time averaging alone – opening up the possibility for palaeoecological data to show stability in past communities regardless of whether they were or not. This is because sediment tends to accumulate at a very slow rate – especially when compared to the rate at which animal communities die and generate skeletal remains. This means that many different generations of a community can become mixed into one single assemblage of fossil remains. “Samples from a series of such time-averaged fossil assemblages are thus very different from the snapshots that come from repeatedly sampling a living community,” said Tomašových. These assemblages will be unable to display variability generated by any biological process operating on scales less than one meter. Despite this, the team do believe that larger scale community trends, such as relative abundances and identities might be well recorded by the fossil record – such parameters as are harder to determine using conventional biological sampling.